Watervale: [Town of South Australia] | Mr. Riggs Wine Co.
Clare Valley Riesling, or more specifically Watervale Riesling. Such few words that can immediately make you think “world class wine”. The reputation of Clare Valley is outstanding among wine destinations. Being one of Australia’s oldest wine regions, the Clare Valley has so much history to it. But for us it’s all about Watervale, a little town south of Clare, where we source our fruit for our Watervale Riesling. 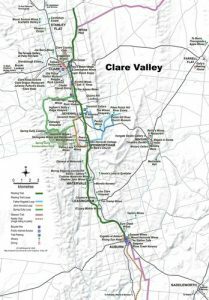 So for those interested, here we have compiled some information regarding the history and terrain of Clare Valley and Watervale. Originally Clare Valley was home to the Ngadjuri Aboriginal People. The Ngadjuri have a rich history of art, as is visible by the many cave paintings around the area, storytelling and stargazing. In 1839 the first European settlement was established. Many of the settlers came from England, Ireland, and Poland. In the 1840’s the first vineyard at Sevenhill, a sub-region of Clare Valley, was planted. Watervale’s place in the history of the Australian wine industry is significant. The first five acres of grapes for commercial use were planted by Francis Treloar in 1853. Most of the Clare Valley’s grapes are grown between 400 and 500 metres. The higher altitude of the valley means cooler nights, even in summer. The season starts and finishes earliest in the southern part of Clare Valley. Budburst usually occurs by mid-September and Harvesting in early/mid-March. There you have it a little information for you about the history and climate of Clare Valley and Watervale.